Austin Lake is a all sports lake, boat docks, power boating, jet skis, slalom course, sailboat races, bass tournaments etc. it is a great lake for swimming, lake depth is 15 feet, and the water level is maintained by Pfizer Corporation within 2-3 inches, they pump in several million gallons a day of purified water they use for cooling only. Pfizer is 8 minutes from property, Portage 8-9 minutes, Kalamazoo-Battle Creek Airport 10 minutes, and Kalamazoo is 20-25 minutes. The ...Learn more here! Austin Lake is a all sports lake, boat docks, power boating, jet skis, slalom course, sailboat races, bass tournaments etc. It's a great lake for swimming, lake depth is 15 feet, and the water level is maintained by Pfizer Corporation within 2-3 inches, they pump in several million gallons a day of purified water they use for cooling only. Pfizer is 8 minutes from property, Portage 8-9 minutes, Kalamazoo-Battle Creek Airport 10 minutes, and Kalamazoo is 20-25 minutes. There are 471 year round homes on this 1050 acre lake. Water Level: Average water level variance? 2-3 In. 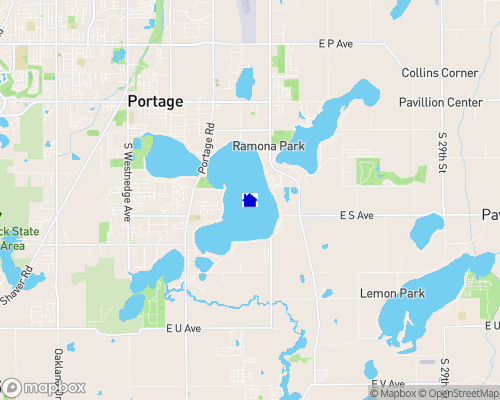 Nearby cities: Portage 8-9 min., Kalamazoo 20-25 min. Nearest airport: Kalamazoo-Battle Creek Airport, 10 min.